Pittsburgh weather is favorable for viewing tonight’s Leonid Meteor Shower, but the Moon is bright in the night sky diminishing the show. Leonids have been known to product dramatic “meteor storms” with hundreds of meteors per hour some years. This year expect 10 -15 meteors per hour in ideal viewing between Midnight and dawn. Elevated rates will drop and then taper off in coming days. 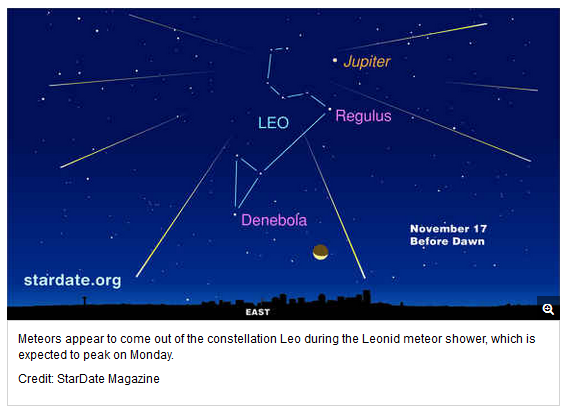 Above is a depiction of the Leonid Meteor Shower Radiant in the constellation Leo ( from another year) showing where Leonid meteors appear to originate in the sky. If you cannot go outside, the Slooh Telescope Community will offer online viewing after 8 PM this evening. To view tonight’s Leonid Meteor shower through the Slooh click here. The Amateur Astronomers Association of Pittsburgh offers Perseid Meteor Shower Viewing at its Wagman and Mingo Observatories at the Perseid peak in August. Please share your Moon photographs on our Facebook Page. Happy Moon Gazing! 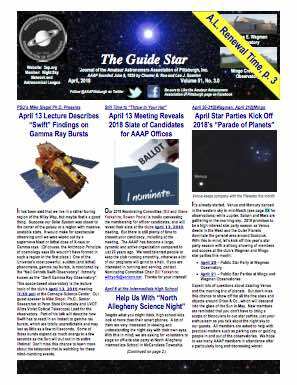 Amateur Astronomers Association of Pittsburgh will meet 7:30 PM, November 11, 2016 at Allegheny Observatory, 159 Riverview Avenue, Pittsburgh, PA 15214. The featured program is the Annual Kevin J. Brunelle Astrophotography Contest. Photos submitted by members will be voted upon by the attendees with the winners announced at the end of the meeting. Join us to see the results of the area’s best astrophotographers. November business meeting follows the program. If you cannot be there check the AAAP Facebook Page for updates and for possible LiveStream. Respectfully submitted, Kathy DeSantis from John Holtz.